The Holiday that never seems to have the same date or even month. I was recently asked why is Easter so late this year. So to get the best answer possible I did some research on the Holiday. It all has to do with the moon. Below is some interesting information leading to this decision of just when Easter will fall each year. In years in which the church’s March equinox and Paschal Full Moon dates do not coincide with the astronomical dates of these events, confusion about the date of Easter can arise. In 2019, for example, the March equinox in the Western Hemisphere happened on Wednesday, March 20, while the first Full Moon in spring was on Thursday, March 21 in many time zones. If the church followed the timing of these astronomical events, Easter would have been celebrated on March 24, the Sunday after the Full Moon on March 21. However, the Full Moon date in March specified by the church’s lunar calendar, also called the ecclesiastical Full Moon, was March 20, 2019—one day before the ecclesiastical date of the March equinox, March 21. For that reason, the Easter date 2019 is based on the nextecclesiastical Full Moon, which is on April 18. This is why Easter 2019 falls on April 21. Cooking or attending an Easter dinner. When dyeing most Easter eggs we tend to use vinegar because that’s what the instructions tell us to do. Some of us will look for dye that doesn’t require vinegar because we can’t stand the smell. Some of us will avoid the mess all together and not dye eggs, and others will use the stickers or crayon method. Which ever you decide becomes a family tradition that gets passed down from generation to generation. And each year it brings up memories and makes you think of all the good times you have had with your family. Cleaning Tip: Vinegar is not just for dyeing those eggs. You can also use it for cleaning. Vinegar’s acidity is what makes it such a good cleaner. Because vinegar is so acidic, it can counteract some icky buildups. It can dissolve away soap scum, brines left by hard water, and glue left behind by stickers. … A paste of vinegar and baking soda can dissolve set red wine stains. National Flash Drive Day on April 5 commemorates the date inventors filed their patent for the first USB Flash Disk. Their invention revolutionized the way we store and manage digital data! As information flowed from our fingertips, the flash drive became the go-to storage device. Called by many names, the USB (universal serial bus) drive makes digital data more accessible than ever before. Today, we effortlessly store photos, transfer files and upload gigabytes. Not only that, but flash drives contribute to making the world a better place. By stretching budgets and services, these super functional devices make virtual classrooms possible. They provide access to information to parts of the world many of us take for granted. In third world and oppressed countries, flash drives go where the information superhighway cannot. Despite being classics to a majority of the population, books considered contraband become windows to the world around them. Comparatively, movies and radio recordings provide the same information to people in underdeveloped countries. In homeless communities, flash drives keep people connected by giving them access photos and a resumé; these items may be a lifeline of hope. Tuck a few bytes into your pocket and celebrate National Flash Drive Day with a few new ways to appreciate the USB drive. Whether you save pictures or back up files, consider how versatile the thumb drive is. Play a retro game or if you have extra devices, donate them to a good cause. Charities across the country deliver your donations to schools, homeless shelters, and nations in need. Use #FlashDriveDay to join the excitement and spread the word about National Flash Drive Day. Here’s a Tip: We talked about cleaning up your technology a few weeks ago. Go buy a couple flash drives (you can get some really cute ones these days) and download all those photos from your computer to one, then all your business files to another. Not only will this allow you to clean up your computer and free up all that space to make it run faster it will also give you that much needed back up that you love to have. While going through which items to remove from your computer to a flash drive you may come across some things you will no longer need ever. Go ahead and get rid of those items. Cleaning your computer can be very rewarding. If you aren’t good at this type of thing don’t be afraid to seek help. 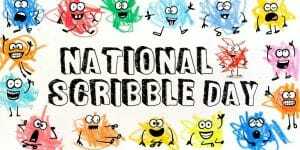 It’s national Scribble Day! Oh the mess that can be made while having fun scribbling. Go ahead and try it, scribbling on a piece of paper can release some built up frustration. Allow your little ones to scribble too. We try to focus on them staying in the lines when coloring or painting, and writing nicely all the time. Make that exception today and allow them to be silly and have some fun. Don’t stress if they make a mess there are ways to get crayon off practically anything by just scratching it away, ink can sometimes be a little more tricky to remove so here is a helpful cleaning hint to remove ink from almost anything. Works wonders on wooden tables. Begin by mixing water and baking soda to form a paste. Spread the paste over the ink stain and rub it in with your fingers. Baking soda can be slightly abrasive, so avoid scrubbing too hard or it may damage the finish. Moisten a soft cloth with plain water and scrub the area as you remove the paste. For larger stains, repeat the steps above until all of the ink is removed. If a haze is left on the surface from the baking soda, wipe the area with a cotton ball moistened with a small amount of rubbing alcohol to remove. Yup you guessed it! There’s more things to clean! Some of these things aren’t thought of as part of your regular spring cleaning. It’s always nice to look at things in someone else’s view because it will open up your eyes to new things. As a cleaning person myself I can visit different places and find things that people have over looked for some time. My parents are good ones for the computer won’t work. By not working they mean it’s running slow and or it keeps freezing, which brings me to more cleaning possibilities. What about technology? Do you have a smart phone that keeps freezing, a computer that won’t load, or a tablet that it seems like every time you want to download something new it tells you there’s not enough space? Well whens the last time you have cleaned up these items? While we all tend to take really good care of our electronics for the most part we really need to DE-junk them. Maybe you have thousands of pictures stored in your phone, screen shots even that you took of a new recipe you wanted to try or a new craft idea. You can back most of these items up to your cloud or google accounts and then delete them off your phone. I normally do this and then go through my storage once it’s on my google account and then delete items I don’t need. Maybe it was I took 20 pictures of my 3 year old just to get the perfect photo for that moment, but I really don’t need those 19 other photos. You may have games you downloaded to pass time but you haven’t played them much in the last month, go ahead and delete those to clear up space as well. What about files you may have saved on your computer for what ever reason? Delete them if you no longer need them. Once you have gone through and deleted everything you can think of run a system cleaner such as Clean Master and it will find more items that are hidden, or that you didn’t think about and will give you the option to delete those as well. I try to run this program on my systems every three months. Freeing up this space will help your device run faster, you may even feel like it’s brand new again. Other things that you may not think about for your normal spring cleaning include your yard, your car, how about that garage! We all have those leaves that either waited until it was too cold to get or something came up and we just didn’t have the time. Now is the perfect time to go ahead and take care of those as well. You may have debris laying around your yard because that pesky raccoon decided to get into your trash or it may have blown there with all that 40 mph plus wind we’ve had recently. This also is the perfect time to inspect that patio furniture, It may be time for new, or you may need to make a couple simple repairs. now how about your car? I’m sure it could use a good cleaning both inside and out. Take advantage of these nice sunny days and detail the inside of your car. When it’s warm enough run it through a car wash to get all that rock salt and dirt off it. Speaking of cars, what’s that garage look like? Can you even park your car in it? Start in an area of the garage and eliminate items you may no longer need. If you are unsure leave it this time, when you do your next big clean if it still sits there untouched get rid of it. This is a perfect time to get all items together that may require you to call for a large trash pick up for your residence. Once you have completed your new spring cleaning list you will feel better not only about yourself but also about everything around you. Just remember if you get to in over your head there are always services out there that will help you with all your needs. Spring cleaning comes around each year. And during that time everyone scatters throughout their homes to find things they can throw away, and to deep clean other areas of the home that may have been over looked. Bathrooms, ovens, inside the refrigerator as well as those closets. All of these are good items to touch up on during your spring cleaning but I also want you to think about cleaning up things such as your Finances and your body. While your finances may have taken a recent hit due to shopping for the holidays, the New Year or you just had to have the latest trend. Now is a good time to sit down and go over your finances and get things back in order. Have credit card debt? Call and set up a payment plan that will allow you to get back on track. Bills that have gone unpaid for whatever reason? Give them a call too, and get those in order as well. Maybe you were setting money aside for a savings account and you fell on hard times so you haven’t done that either. Do you constantly find yourself in a crunch when it comes to getting your finances in order? Reach out to someone and ask for help. This could be a family member, a co-worker, or maybe even speaking to an account. Don’t be afraid to see help to get your finances back in order. Everyone runs into a problem sooner or later. Now lets’ talk about your body! We all know setting those New Year resolutions never stick. So let’s focus on that now. It is a perfect time to start treating your body better rather it’s a change in your diet, or getting some exercise (as easy as just going for a walk). Again this isn’t something that comes easy to a lot of people and if you don’t have the right support it can be hard. Try setting small goals for yourself such as today I’m going to pick an apple for a snack over this bag of chips, or instead of watching TV get up and go for a walk just a few blocks through your neighborhood will do. Soon your body will start to feel better because you have made that better choice and things will become a little simpler over time. Don’t be afraid to talk to your doctor if you are struggling with something within yourself. Take time for yourself to decompress. This could be sitting in a quiet room, or even outside (warmer weather is coming I promise). No one will take care of you the way you should be taking care of yourself. Sometimes you have to put yourself before others so you can accomplish self-care. Here are some quick and easy tips to keep your bathroom sparkling. Clean grout gives your whole bathroom a facelift. Hint – CLR Bath & Kitchen Cleaner erases stains and soap scum. Rust makes fixtures look old and worn. Never use bleach cleaner on the rust satins, it will help it set in. For light rust marks, saturate a cloth with lemon juice and apply. You can also use a paste made of lemon juice and salt to scrub rust satins away. You can toss mats and plastic curtains in the washer to remove gunk and mold. Wash on a gentle cycle and warm water. Adding bleach is safe. Tumble-dry liners on low for 2 – 3 minutes. Hint – To prevent mold, hang mats and spread liners to dry after use. Add an in-tank cleaner and it will keep the bowl fresh for the daily use toilets. For the occasional used toilets, use a in-bowl version. Hint – Scrubbing Bubbles Toilet Gel works for up to 7 days. Use a liquid or foaming soap with a pump or even a hands free dispenser to eliminate the goopy soap dish to keep your sink and countertop cleaner longer. The shift from Washington’s Birthday to Presidents’ Day began in the late 1960s when Congress proposed a measure known as the Uniform Monday Holiday Act. Championed by Senator Robert McClory of Illinois this law sought to shift the celebration of several federal holidays from specific dates to a series of predetermined Mondays. The proposed change was seen by many as a novel way to create more three-day weekends for the nation’s workers, and it was believed that ensuring holidays always fell on the same weekday would reduce employee absenteeism. While some argued that shifting holidays from their original dates would cheapen their meaning, the bill also had widespread support from both the private sector and labor unions and was seen as a surefire way to bolster retail sales. President’s Day never falls on the actual birthday of any American president. Four chief executives—George Washington, William Henry Harrison, Abraham Lincoln and Ronald Reagan were born in February, but their birthdays all come either too early or late to coincide with Presidents’ Day, which is always celebrated on the third Monday of the month. 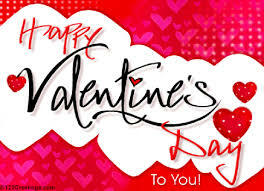 Valentine greetings were popular as far back as the Middle Ages, though written Valentine’s didn’t begin to appear until after 1400. The oldest known valentine still in existence today was a poem written in 1415 by Charles, Duke of Orleans, to his wife while he was imprisoned in the Tower of London following his capture at the Battle of Agincourt . (The greeting is now part of the manuscript collection of the British Library in London, England.) Several years later, it is believed that King Henry V hired a writer named John Lydgate to compose a valentine note to Catherine of Valois. Here are some quick and easy cleaning tips for some spotless living spaces. Put on overhead light fixtures too see cobwebs and particles lurking on moldings, fans and fixtures. If out of reach, use an extension tool to wipe globes and trim. Hint – Oxo’s microfiber extendable duster is a washable and pivots to get every spot. Pull furniture away from walls to vacuum under and behind. Nab the dust along the baseboards and clean the carpet dents with your vacuums upholstery tool. Hint – Fluff matted carpet tufts with a steam iron or garment steamer. Wash or dry-clean curtains. Or if the need refreshing, tumble them on the dryer’s air-only setting to remove dust and you can add dryer sheets for a fresh sent. Hint – Try Dryel’s new in-dryer kit. It steams fabrics and includes a pen for stains , plus an odor and wrinkle removing spray. You can spray upholstery and carpet with an antistatic spray, like static guard and it will break the charge that causes fur to cling to these surfaces. It will now be easier to gather or vacuum up the pet fur. Groundhog Day falls on February 2 in the United States, coinciding with Candlemas. It is a part of popular culture among many Americans and it centers on the idea of the groundhog coming out of its home to “predict” the weather. Groundhog Day is a popular observance in many parts of the United States. Although some states have in some cases adopted their own groundhogs, the official groundhog, Punxsutawney Phil, lives at Gobbler’s Knob near Punxsutawney, Pennsylvania. The town has attracted thousands of visitors over the years to experience various Groundhog Day events and activities on February 2. The Punxsutawney Groundhog Club plays an important role in organizing Groundhog Day in the town. Club members, news reporters, locals, and visitors meet at Gobbler’s Knob on February 2 each year to await Phil’s appearance and his weather prediction. 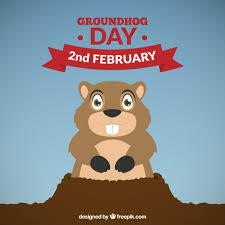 Pennsylvania’s governor has been known to attend Groundhog Day ceremonies. Many weather researchers questioned the groundhog’s accuracy in predicting the weather, but some of the groundhog’s fans may not agree. Groundhog Day is an observance but it is not a public holiday in the United States. However, areas around parks and some streets may be busy or congested in towns, such as Punxsutawney, where Groundhog Day events are popular. Thousands of years ago when animalism and nature worship were prevalent, people in the area of Europe now known as Germany believed that the badger had the power to predict the coming of spring. They watched the badger to know when to plant their crops. By the time the first German immigrants settled in Pennsylvania they probably understood that this was not true but the tradition continued. Unfortunately, there were not many badgers in Pennsylvania so the groundhog was substituted for the badger. Tradition has it that if the groundhog sees its shadow on February 2 it will be frightened by it and will then return to its burrow, indicating that there will be 6 more weeks of winter. If it does not see its shadow, then spring is on the way. Punxsutawney held its first Groundhog Day in the United States in the 1800s. The first official trek to Gobbler’s Knob was made on February 2, 1887. It is said that Punxsutawney Phil (the groundhog) was named after King Phillip. He was called Br’er Groundhog prior to being known as Phil. Canada also celebrates Groundhog Day. The movie “Groundhog Day” from 1993, starring comedian Bill Murray, made Punxsutawney Phil in Pennsylvania famous worldwide. The film’s plot added new meaning to the term “Groundhog Day” as something that repeats itself endlessly.